We provide our customers with premium quality Rotary Air Lock Valve which can be designed as per the clients specifications. Our Rotary Air Lock Valve is made keeping in mind the needs of the users, hence they are ideal to be used in the various industries. The Rotary Air lock Valve offered by us are competitively priced. 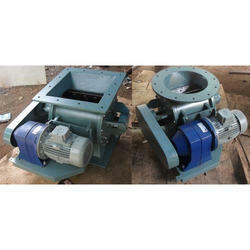 We are manufacturer and supplier of Rotary Air lock Valve that are widely used for many industrial applications. Manufactured using utmost quality metals, we assure the long lasting life of the lock valves offered. Rotary airlock is useful as one component in a bulk or specialty material handling system. These valves are also available in variety of sizes and capacities as required by our clients. Looking for Rotary Air lock Valve ?